ThinkDigits is a unique iPhone application that is a must have for folks who use Mindmapper software packages such as MindManager to manage their thoughts and everyday plans. ThinkDigits mind mapper also comes with a notebook and a calculator. This really makes it attractive to the mobile entrepreneurs. These folks take notes of new ideas and brainstorm all the time, and ThinkDigits makes it easy to go through the process on the go. Many folks argue that the formulas that come with the software are very simple, and the what if scenario feature is not that useful. I personally don’t believe ThinkDigits is to be used as a calculator. In reality, ThinkDigits is an information manager that helps you put things in the right order. Ignited software has updated the application for full compatibility with the new iPhone firmware. 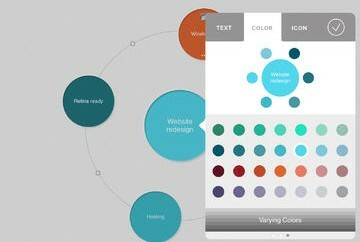 If you are looking for a mind map software on the iPhone, you should definitely give ThinkDigits a try.